Cthulhu’s Corner: Save Our Eldritch History! This week’s column is a bit of a departure from the normal “week in the life of” format that I have been following. Today, instead, I want to draw attention to an issue which is, honestly not as important as my life, but is still worthy of notice. Specifically, I would like to address the recent push to tear down a vital piece of our town, an edifice that speaks to our history and our heritage, a structure which evokes an emotional response in all of us: the Old Asbestos Factory at the Edge of Town. 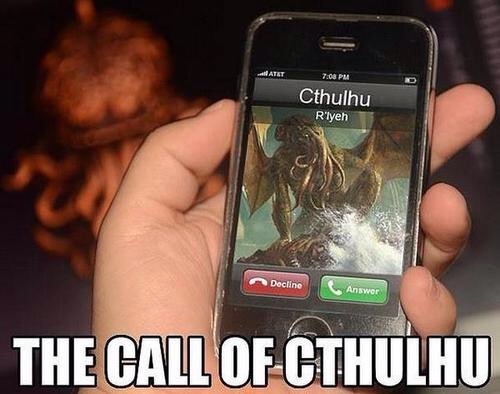 For the first time in what feels like strange aeons, your favorite Elder God’s life is looking up! I have had a week that was absolute gangbusters on all fronts. This was exactly what I needed after the last few weeks, what with the drama with Nyarlathotep and Arissa. It felt great to get out of my own head without having to muck about in the collective unconsciousness of your pitiful race. Let me tell you all about it! Original Artwork For Cthulhu’s Corner! 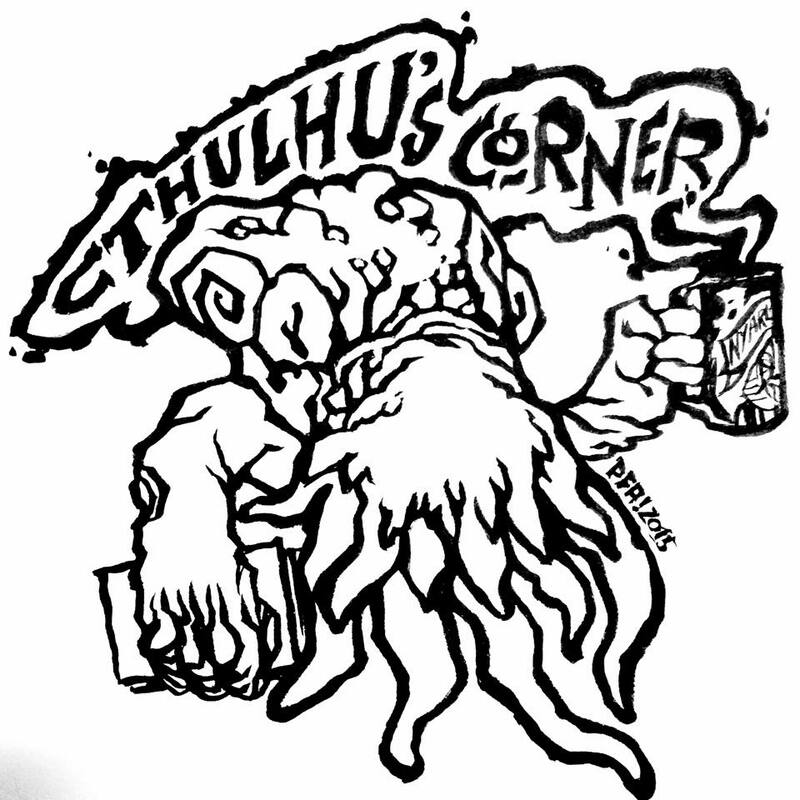 We’d like to present the new logo that will be attached to our ongoing ‘Cthulhu’s Corner’ column. 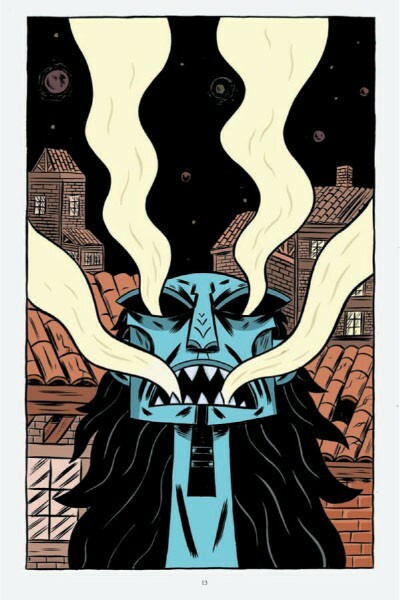 This is an original piece designed and drawn by Friend of the Spew Joel Pfannenstiel, owner of the world-famous Astrokitty Comics in Lawrence Kansas, Artist Extraordinaire, and Owner of Hard To Spell Name! Check out more of his work at his blog: http://thepsysquatch.tumblr.com/. And if you’re ever in Lawrence on a Saturday, look up his awesome Super Nerd Night events! I hate to say it but… I might have to change coffee houses. It’s not easy for me to say since I’ve been coming here for a long time and have worked really hard to make sure I get exactly what I want every time I order (lest anyone think I’m acting entitled, remember that this is just good business on Starbucks’ part). Plus, I have found the environment here to be extremely conducive to completing Dreams of R’lyeh, but I’m not sure if this particular situation can be reconciled. Nyarlathotep always smoked a bit too much if you ask me. Image by Chuck BB via BOOM! Studio. This last week was a tsunami here at home. Not a literal tsunami, neither in the sense of torrential rain nor the production of vast amounts of literature. No, rather it was a metaphorical tsunami comprised of stressful events. I was busy is what I am trying to convey. The dark heart of the matter, beating with the corrupting energy of old “friendships” was a vist from one of my Eldest acquaintances. Let me offer you some advice right off the bat: If Nyarlathotep ever asks if he can crash at your place for a weekend, you tell him firmly and flatly to find a hotel. Granted, I’m sure that none of you will ever have the opportunity to host even a minor celebrity and sometimes-envoy of the Blind Idiot God who seethes at the center of the universe, but I’m sure the thrust of my argument can still be understood by those less important than I am. They say pets resemble their owners, but I just don’t see it. I haven’t really said anything yet, but about two weeks ago, I was talking to Arissa (for those of you not keeping score, she happens to be my regular barista at the Starbucks I frequent) and she kept going on about her cat. His name is Huxley and he’s a 2 year old grey tabby rescue who likes to lick Arissa’s face to wake her up. He’s fixed, had all his shots, and she likes to dress him up as an elf for her Christmas card photo every year. The idea of possessing a lower life form as a companion is somewhat lost on me. As I understand it, the creature (who is, as she described, “totes adorbs”) is not bound by any blood vows or sacrament, its will is not bound to her own; it simply lives in her loft and eats food that she buys for it. It seems rather upside-down to me. This is from an expose conducted by a locally-produced magazine that was supposed to run in a few weeks as part of a series highlighting important artistic voices in the community. Unfortunately, due to politics and the demands of the entrenched media landscape, the magazine was forced to shut down. I felt that the piece, which was definitely written by a human journalist and not by me, still deserved to be read. It sheds light on aspects of myself that should help you form more rounded and complete image of my character. Again, this was not written by me, it was written by a different journalist who was just fantastic and was not me, even though I am also a fantastic journalist as I am sure you are all aware of by now from having kept up with my writing in this column. Okay, I know I need to be working on “Dreams” right now (I’m sure you’re all anxious to see it published), but I have to get something off my chest first. As you no doubt have already heard, I have been named Editor-in-chief of The Monthly Spew. To be perfectly frank, I’m not at all surprised that I’d be picked even above the mortals who have been tenured in this endeavor, given my influence and my artistic vision, but I was clear when I accepted: I do not intend to make this permanent. When I took the position as contributor, it was because I was already writing a blog and I really just wanted to help a friend get exposure by attaching my name. This is not my career; this is not my calling. 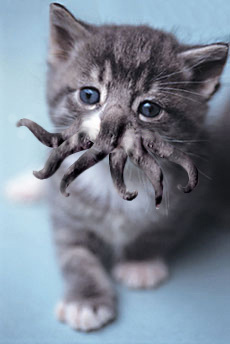 I am doing this just to pad my résumé while I wait for Dreams of R’lyeh to congeal. So in the meantime, rest assured that I fully intend to bring what only I can offer to The Monthly Spew and that is an unparalleled level of quality and creativity. You can expect to see an exponential increase in both the quality and volume of content on this site you’ve come to appreciate.